Welcome on the webpage of the boarding house ADONAI SLOVAKIA. The boarding house is situated in Banska Bystrica, approximately 15 minutes away from the town centre by foot and offers qualitative accommodation. You can get to the boarding house easily by car and we provide parking free of charge, directly in front of the house. 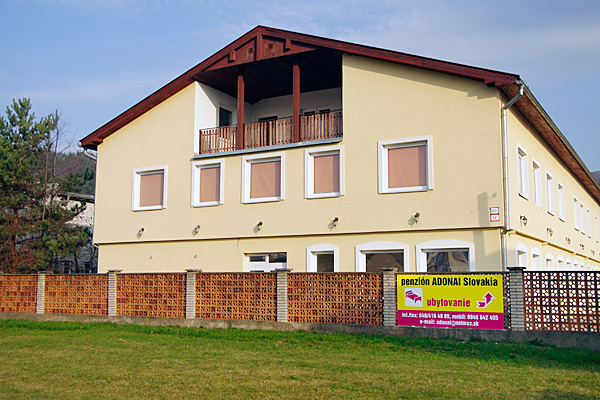 The Boarding House ADONAI SLOVAKIA is situated in Zvolenska Cesta in Banska Bystrica and neighbours with TERRANOVA. Shopping centres such as TESCO and BAUMAX are in its close proximity. The boarding house offers five sigle-bed rooms and nine double-bed rooms. There is also a room (capacity of approx. 40 people) that can be used for staff training,lectures and/or seminars, with the possibility of buying refreshments directly in the boarding house. The vicinity offers recreational possibilities such as: hiking in Low Tatras, a roofed swimming pool, beach swimming pool, a historical centre of Banska Bystrica an obervatory and much more. Should you need any additional information, feel free to contact us. You can find the contact information under the ‘Contacts’ tab.